“The Hunt” begins with a great tracking shot that weaves its way through the chaos of the crime scene from last week’s sting operation gone wrong. It’s a visual touch like this by director Steve Shill that throws us into the mess. Instead of getting a series of organized shots and cuts, we get chaos and dislocation of space. That is, until Major Rawls shuts everyone up and tells everyone who isn’t working the case to get out. At this point, continuity is restored, and business begins. Unfortunately, this pull between rationality and emotionality (also well explored in the recent Steven Soderbergh film Contagion) is not as simple as it seems. Freamon arrives on the crime scene to see his crew standing around, looking hopelessly. He orders them back onto the phones, and forces them to realize if they really want to help Greggs, they will want to be there to find out who did this. Stringer, working on the other side, also knows that emotions can’t get into play. When Wee-Bey explains what went wrong, he orders Little Man’s execution, knowing otherwise the consequences for the entire operation are in jeopardy. Savino, who set up the deal, is spared, given that he is not only rational and will take the hit for the team. I think a great portion of The Wire is how it shows how crooked both sides can be. 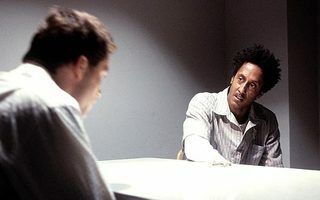 McNulty meets with the Barksdale Lawyer, Levy, and brings Pearlman with him. He orders far beyond his reach, and she reluctantly backs his charges against Savino. Later, he berates her for trying to play fair, all in the name of politics. But as much as McNulty is right, Pearlman calls him out for being a self-centered cop who is simply using her and everyone else he knows. In the end, everyone in this game is self-centered and looking out for themselves. Thus, Burrell tells Daniels the score, “Dope on the table.” Daniels knows that if they take the stash house, they will lose any footing they have on taking out the Barksdale operation. They at first offer a new alterative in the low-rises, but a mole rats outs their prize possession. McNulty goes to Judge Phalen for help, but he can’t risk his position in the election. And thus, the house is taken, the drugs and money confiscated, and the press conference organized. That final scene rang curiously for me personally, after seeing the events of the so-called Operation Ivy League while I was attending Columbia University. 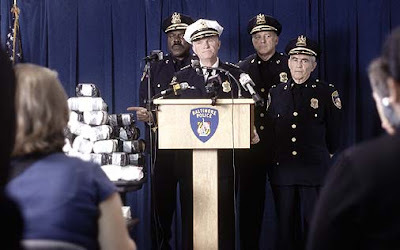 As much as catching any sort of drug dealing is a betterment to society, what Mr. Simon suggest with this final scene, is that often these high-profile busts are the least useful to society and the drug war. Look at Bubbles in tonight’s episode—simply attempting to tell McNulty he’s clean, and that he can’t do CI work. McNulty won’t listen; he’s too busy trying to do his part in stopping the drug war. But perhaps our focus should be on Bubbles. Confiscating drugs puts a dent in our drug culture, but so can helping someone stay clean.